PHXAM weekend nightlife in downtown Phoenix begins Friday night at Legend City Studios with a Ben Horton art show along with a surprise musical guest. Saturday night, The PHXAM After Party at The Pressroom, VANS presents Method Man & Redman along with special guests Loserfur, Drunk Dom and the Roaches, DJ Th0t Goth, and Dannydirtsquid. In the midst of the musical talent, Cowtown will premiere “A-hole” it’s latest video project filmed and edited by Braden G. Doors at 8pm and you can pick up tickets at any Cowtown location for $15 or ONLINE for $20. All after party ticket proceeds will be going towards building a skateboard plaza in Central Phoenix! 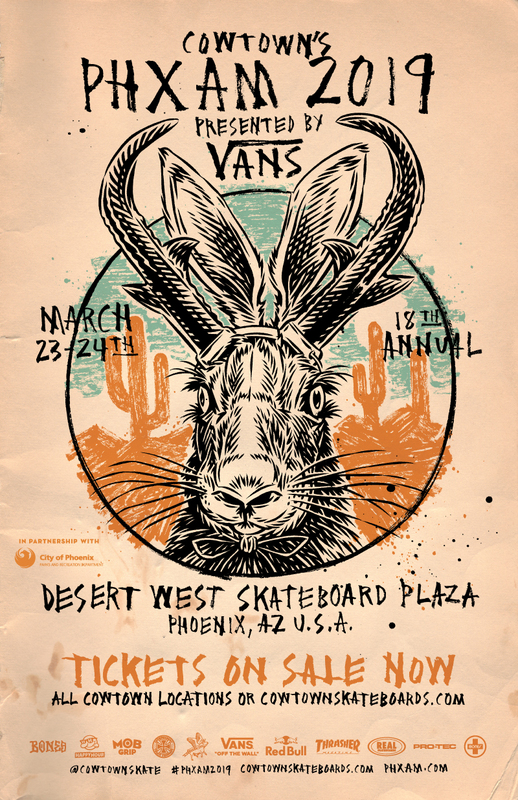 With the support of VANS, Red Bull, Real Skateboards, Pro-Tec, Mob Grip, Bones Wheels, Independent Trucks, Bones Bearings, Happy Hour Shades and the City of Phoenix, 2019 will be the best PHXAM yet!